I must be on a a list of “Most Vain Dad Bloggers” because I get asked all the time to review personal grooming items. 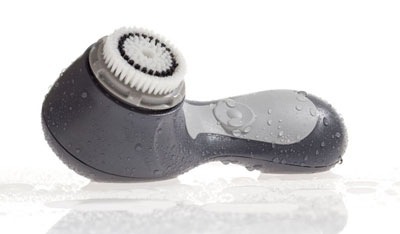 The latest is from Clarisonic, a brush that applies your soap and scrubs your skin and apparently uses sound to lift dirt out of pores or something. I don’t actually understand it. It could be magic. So, Clarisonic sent me one of their brush things, and I started using it. The claim, for men, is that in addition to encouraging face cleanliness, using this device to apply shaving cream will result in a closer shave. I haven’t noticed a difference in the shaving experience, or at least not one that I can attribute solely to applying shaving cream with this thing instead of by hand, but my face is cleaner. Why is it cleaner? Well, I have the Clarisonic sitting on my counter and I feel a little guilty about just washing my face with soap when I could take a minute (20 seconds on the forehead, 20 seconds on the chin, 10 seconds on each cheek: it beeps at you when you’re supposed to switch) and use a soft brush to help do the washing. So I’m washing my face more often, and actually scrubbing it (and maybe getting some kind of benefit from the sonic-ness of it all, but it’s hard to tell), and this is making my face happier. I haven’t used it in the shower yet (one of its features is a water-proof case), but I have no reason not to. I already shave in the shower on occasion anyway. If it ever gets moved to a drawer, though, I might forget about it. (And this could very well happen as my wife and I compete over counter space.) That’s the kind of guy I am: I get a toy, play with it for a while, then move on to a new toy. This particular toy hasn’t struck me as life-altering on its own. It’s one of those things that I might get as a gift for someone, even though they would never have said “I wish I had something to clean my face better.” It appeals to my gadget-y nature. It looks nice, it seems well-made, and it actually cleans your face (even if the sound isn’t doing anything, those bristles sure are). But, oh my god, I literally just checked the retail price on this: It’s $195. Look, if you’re in the face-care business, where your face is your investment, I can see adding a two hundred dollar piece of equipment into the mix as an insurance measure. Or, maybe if you wear makeup that you need to take off every night (this is one of the selling points), you need some extra help and facecloths aren’t doing the trick, yes, buy this and put it on the counter. But for someone casually vain, like myself, I could not say that I would consider this expense as worthwhile. Yikes. I have a Clarisonic and it HAS changed my life. As a 35 year old woman that USED to have adult acne it is a miracle for my skin. I keep mine in the shower and use it every day with a good acne cleanser. I have not had a zit in 6 months. Which has done wonders for my self confidence. I think it is every bit worth the money I paid for it. Mine is the plus model that also has the body brush and the counter top cradle charger. It was around 250.00. I have had it for a little over a year and it has more than paid for itself with what it has saved me from trips to the dermatologist and the facialist. I say if you are an adult with Acne you MUST have this in your arsenal. It's so hard to believe you could be on a list of “Most Vain Dad Bloggers”! I mean where would an idea like THAT come from??? I love that your reviews are upfront about being overdue. The guilt is just erased, isn't it? Next Next post: The Craftsman Blogger Summit: Wow, that was like, two months ago.